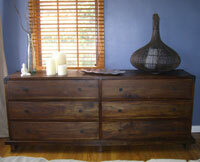 As the owner of Tansu.Net, I am lucky enough to have access to a great deal of wonderful Asian Furniture. I am constantly asked by my online customers what furniture items I have chosen for my home and why. In response to these inquiries I have begun to photograph pieces of my home with an explanation of the Asian furniture items we chose. Please excuse the photography; I am far from being a professional! For our bedroom my girlfriend (also the resident Tansu designer) and I chose the Tropical collection queen size canopy bed. We have both always wanted a canopy bed and this one is our personal favorite. Made of dark reclaimed mahogany the Tropical collection canopy bed is features clean lines, a modern tropical style and small accent details that are formed by the mortise and tenon construction this piece. If you look closely at the sides of the canopy bed posts and the matching Tropical nightstand you will see that the cross supports fully bore through upright posts and actually stick out the other side. Not only does this make for a beautiful design element but it also makes this canopy bed extraordinarily strong! Because of limited space we opted for a queen instead of king size canopy bed. 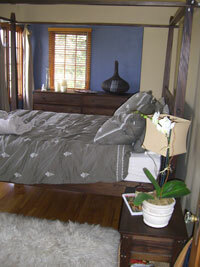 Of course if you have the space the Tropical king canopy bed is even more impressive visually than our queen. For the bed side table we love the matching Tropical nightstand but chose the 6 drawer Kobe dresser instead of the matching Tropical dresser. 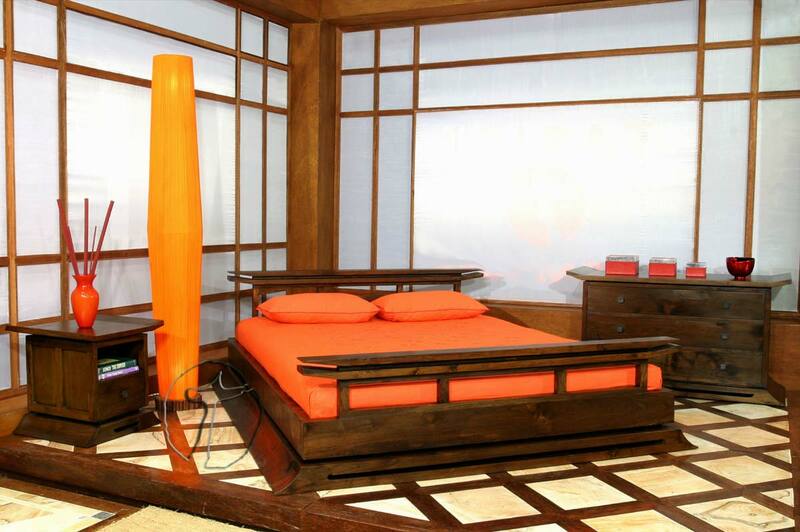 One thing many people ask is whether we recommend mixing our teak Asian furniture pieces with our mahogany pieces. Here is living proof that the answer is a resounding yes! The Kobe 6 drawer modern Asian dresser is made from reclaimed teak wood and looks great next to our mahogany canopy bed. Though the grain pattern on mahogany is tighter with more curls than teak, we use the same stain on both woods so the color similar between the pieces with each wood type offering its own tones. Design wise both of these pieces feature clean bold lines with subtle details that have made both of these items showroom favorites. 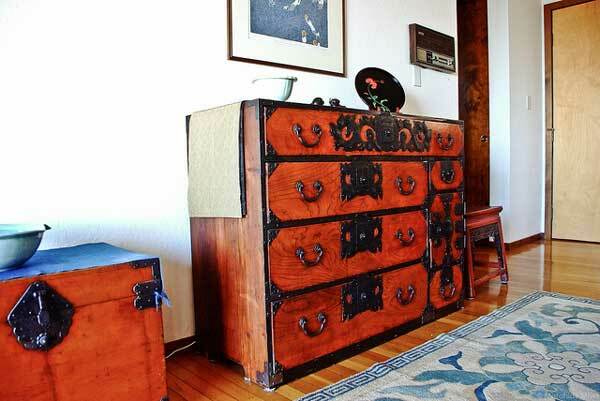 You can safely mix and match almost any of the Asian furniture pieces sold at Tansu even if made of differing wood. If you are unsure about a combination, give us call. We can help you decide whether individual pieces from different collections will complement each other. This entry was posted on Thursday, June 4th, 2009 at 2:38 pm	and is filed under Asian Furniture. You can follow any responses to this entry through the RSS 2.0 feed. Both comments and pings are currently closed.